I feel like we got a lot accomplished today, it's a good feeling. This may largely be due to the fact that we worked on a lot of small projects (which also need to be completed, and often take more time than a big project). 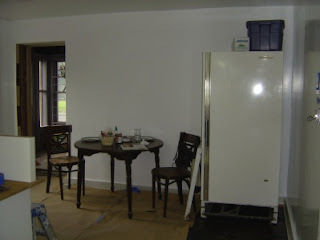 ... and today we moved the freezer and dining table back into the wait station to clear out the dish station (actually we moved everything but the sink out of the dish station). 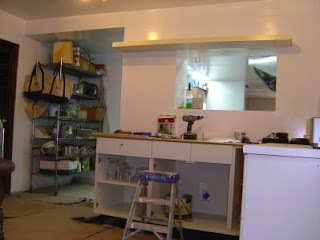 With the dish station almost empty we started finishing the drywall job (to be completed tomorrow), so that E! 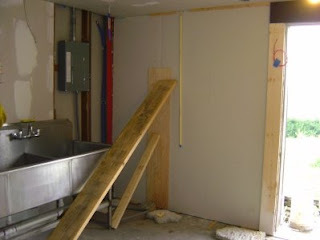 can start spackling, priming, and painting (you know the drill). 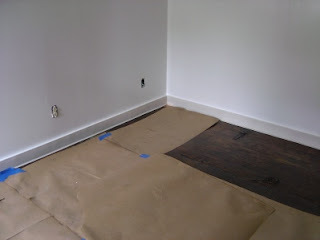 Today was all about little details, installing a shelf above the pass, hooking up outlets, patching holes in the wood floor. Little details, which all require attention and time.